A bit of a Cider update: It's been nearly two weeks now, and we strained off the fruit and racked the cider into a new container, adding a bit more sugar. 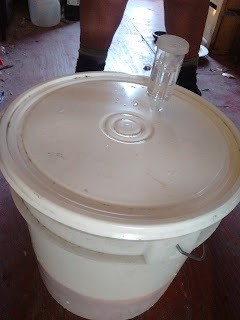 Showing 4.59% ABV on the hydrometer. Tastes wonderful. Will rack again over the weekend and bottle. Love doing stuff for ourselves. 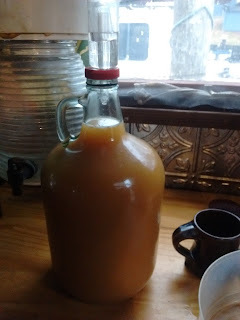 And, as an update to the update: (Dec. 1 now) Been a couple of days, and the Cider has stopped it's second fermentation (which was really energetic), so we've racked it off into a couple of growlers (with a bit of sugar to give it a bit of fizz) and a carafe for immediate consumption as a still Scrumpy. Showing 6.56 % ABV now. Yay! Hey, new stuff at Life, Art, Water. Check it out. 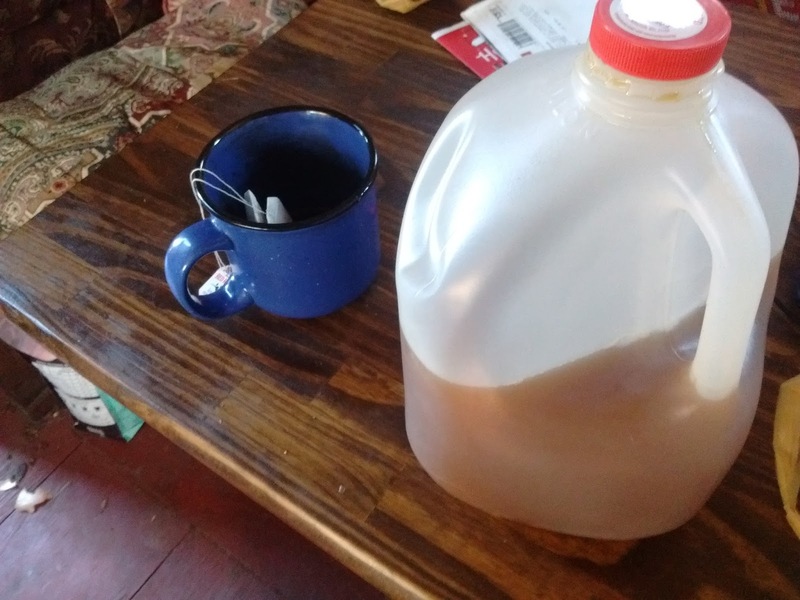 So here's some of the fixin's: Organic apple juice, a cup of double strong tea. . .
And, of course, diced gala apples and strawberries. 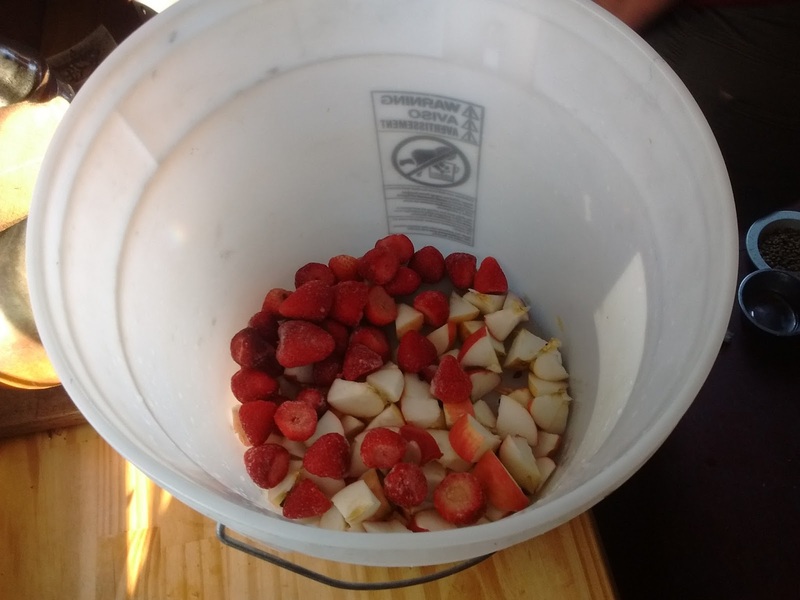 So dutifully, we added some of Bauger's wonderful apple juice with a bit of strong tea and some chopped gala apples and frozen strawberries from summer. . .
Gotta love the stick blender. We use it for everything. Macerate well, pitch in a packet of Lalvin K1-V1116 wine yeast after rehydrating, a cup or so of brown sugar, and some raisens. Here it is, perking away. Snap on the lid and a fermentation lock, and watch it bubble away. 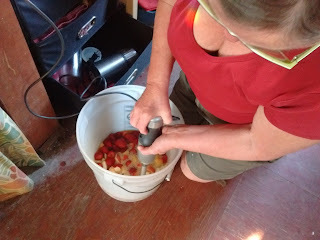 We'll strain it off the fruit at about a week and add a bit more sugar, then bottle it at two weeks or so, with a bit more sugar to give it a bit of fizz. Should be ready for New Years. . . .
. . . .who am I kidding, it'll never last that long. We survived another Turkey Day with friends (the good news is: The dishes are done. The bad news is: It's time to eat again), and now we're back into our winter prep and working on designs for the NEXT boat we're building. More on that later. For the moment, it's chopping wood, tidying up stuff, and making ourselves snug for the winter. . . . . and it's a good thing. Okay, so here's the deal: We're still in the throes of working out the details of our decision to go carless. So far, so good, but it has made some changes in how we do stuff. We find we do a lot more shopping locally (within walking distance. . . not that we didn't before) because we are forced to be aware of the cost of transit. We also have been ordering a lot of stuff on the internet that we would have otherwise driven about shopping for. 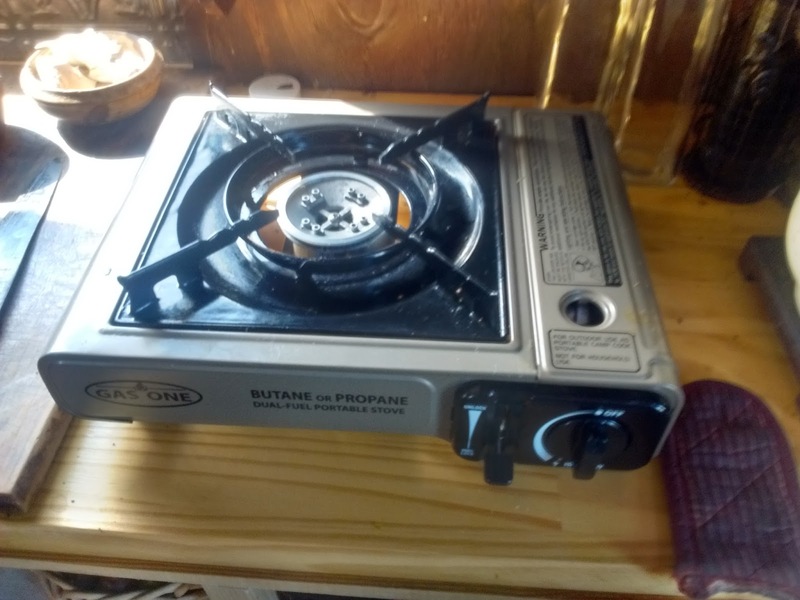 One of the more interesting effects has been on our propane/butane usage. 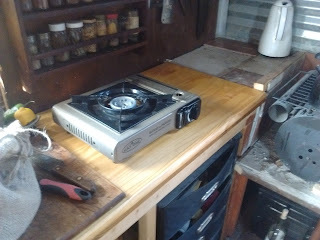 While we do some of our cooking on the woodstove, we also use our little Gas One dual fuel stovetop for a lot of stuff. The trouble is, fetching propane or butane for the stove is no longer as convenient as it was with the car, entailing, at the very closest, hiking up to Target to get gas bottles and then carrying them back. Then there's the irritating and very UNecological disposal of the empty, non-refillable, and non-recyclable containers. So after looking at the prospect of quite a bit of winter hiking to get stove fuel, we decided to hook the little burner (and it's accompanying pressure regulator) up to one of the ubiquitous 20 LB refillable propane cylinders, which, we figured, would only have to be refilled or exchanged every three months or so. Routing the adapter hose through the forward bulkhead. 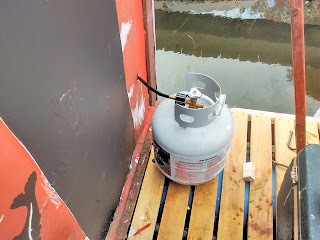 Not wanting a rather large bottle of explosive gas inside the boat, I plumbed the adapter line through the forward bulkhead so the gas bottle can sit on the foredeck. Here's where she'll sit. In coming days I'll build an enclosure and seat to cover. 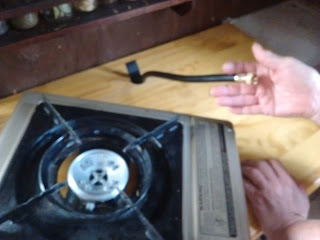 Once it was all connected and hooked up, we turned on the gas and checked the now pressurized hose connections with soapy water. Bubbles=Leaks of Explosive Gas. Do NOT skip this part. The stove in its new configuration works fine. 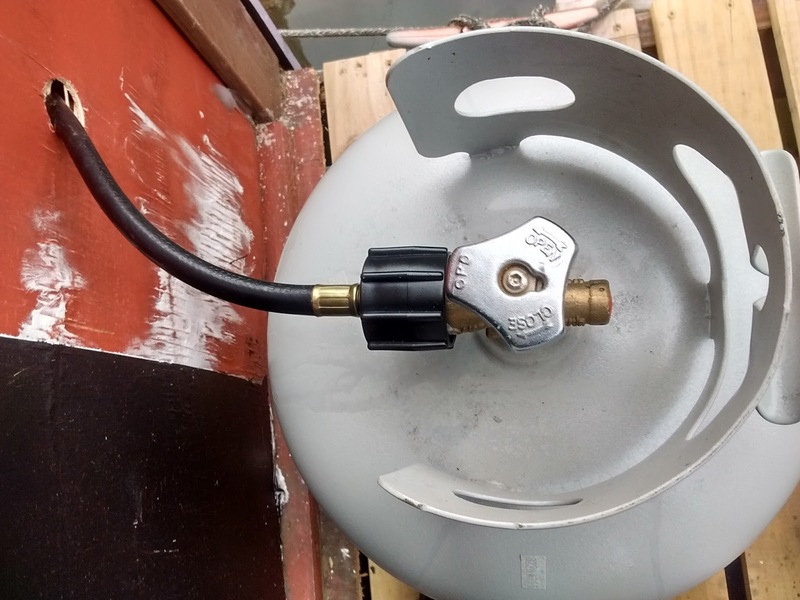 The installation had the added plus of freeing up counterspace from the hose and bottle. For the next couple of days we'll be shutting off the gas at night and when we leave the boat, and checking our fittings for leaks to make sure it's secure, but for right now, it seems to be working just fine. More details as we use the unit. 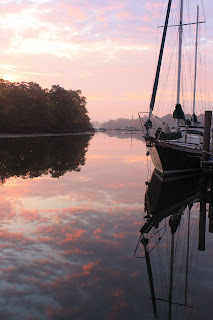 Hey, more stuff and some great photographs over at Life, Art, Water, check them out!